Back in the 90s when basketball players could pretty much do anything, naturally this skill on the court translated to acting talent. The next obvious step is to act alongside wisecracking cartoon characters and Wayne Knight, thus Space Jam . If this came out today Jordan would have had to resign. Our tale begins in 1973 with a young Michael Jordan shooting hoops in the middle of the night as "I Believe I Can Fly," a song which doesn't exist yet, plays over the scene. We are reminded that Michael Jordan had dreams, ambition, and drive, in case we forgot. A quick 3 1/2 minute opening titles roll later and we're in to the meat of the story. In a galaxy far, far away is the alien amusement park Moron Mountain. When its owner (voiced by Danny DeVito) decides the park must be at least 87% loonier, he sends his diminutive minions to kidnap the Looney Tunes and place them into forced labor camps for fun and profit. 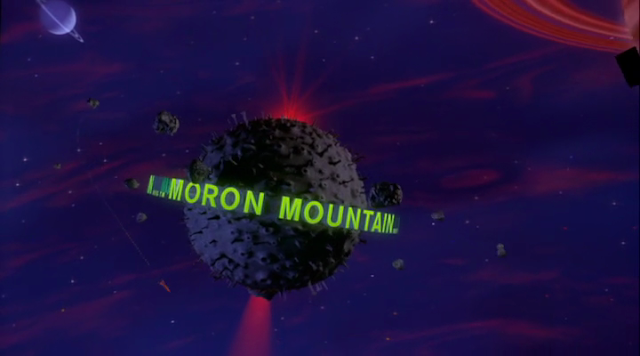 "Moron Mountain" considered an alternate title for Your Stupid Minds. 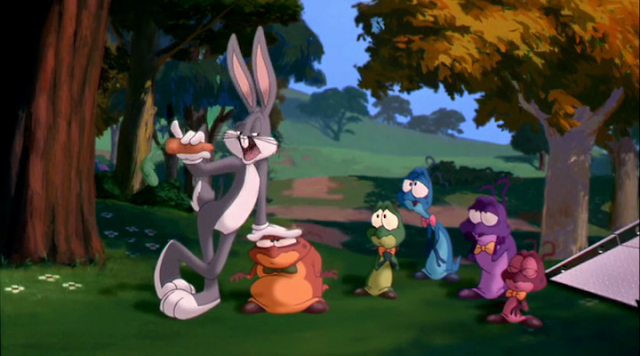 Bugs and the gang concoct a devious plan to trick the aliens by challenging them to a basketball game, due to the invaders' small stature. No one in toon land has ever played basketball before, begging the question, why basketball? Why not a rocket skate race? Or anvil lift? Or hell, why not a "being tall" competition? How about a Carrot Eating Competition? 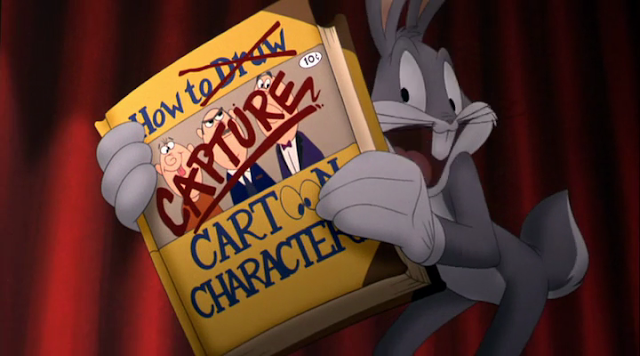 You're clearly good at that, Bugs! The aliens beat the toons at their own game by heading to earth (the only planet, as far as I know, that has basketball) to steal the talent of some of its greatest stars. Patrick Ewing's sweat magic disappears, Charles Barkley becomes turrhable, and Muggsy Bogues is "just another short guy." The aliens entrap their talent into a glowing basketball, and the players now stumble around the court shamed and scared. They're really the most tragic part of the film. Desperate, the toons do some kidnapping of their own, lassoing Michael Jordan in the middle of a golf match with Bill Murray, personal assistant Stan (Wayne Knight), and Larry Bird. He whips the toons into shape in time for the big game. 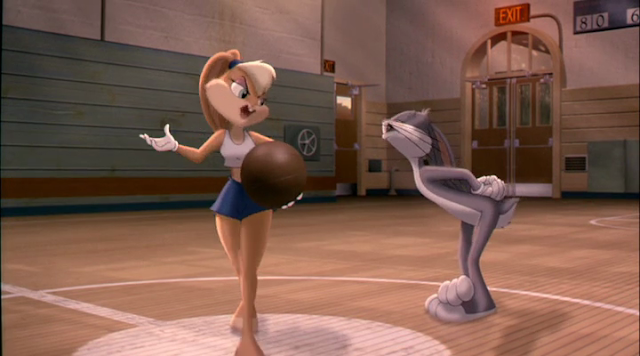 Luckily they already have some talent in Lola Bunny, the franchise's own hip Poochie last minute addition. How is she independently good at basketball on a planet full of talentless maroons? Bugs tricks his teammates into thinking water is some special potion, and they play wonderfully and win the game. The moral of the story? Fake juicing beats real juicing every time (if you're a cartoon character). Also Bill Murray is there. 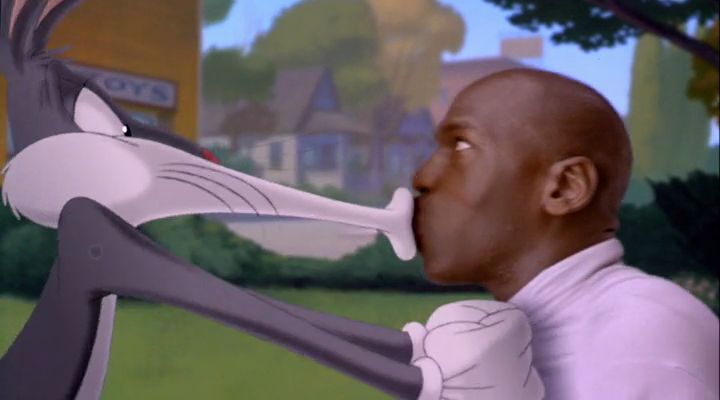 Space Jam is a movie so steeped in nostalgia I can barely remember it existing in the present. I only have vague glimpses of $80 Six Flags fanny packs and engraved limited edition McDonald's collectable mugs. I even craved a Quarter Pounder as I watched it! Now that's effective marketing! This has nothing to do with the previous paragraph. I just find it funny. Despite its dated faux cool extreme lameness, padded plot, and nearly nonsensical internal logic, there is a lot to enjoy. The computer effects are dated but the 2D animation is done with a lot of care. I found myself laughing a lot more than it really deserved, and there is some charm in what is essentially the biggest athlete in the world not only starring in such a film, but using it to poke fun at himself and career decisions. Also the basketball player cameos are pretty hilarious. Charles Barkley will always be funny no matter what he does. Player: That was a strikeout, Mike? That was a good looking strikeout. Real good! Stan: Come on Michael it's game time! Get your Hanes on, lace up your Nikes, grab your Wheaties and your Gatorade and we'll pick up a Big Mac on the way to the ballpark! Jordan: It's a man's game. And you can't play. 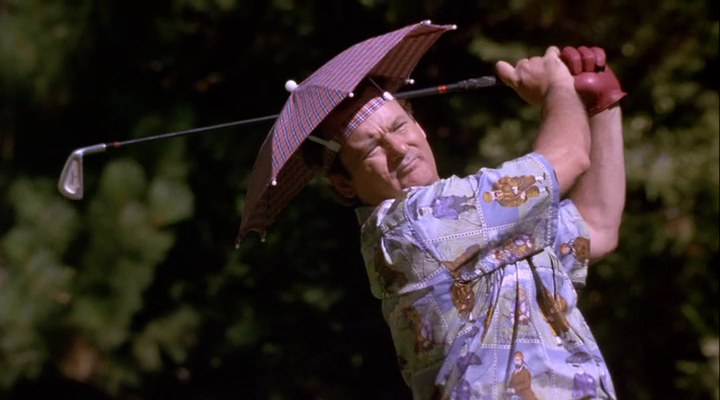 Bill Murray: What if I try really hard? Murray: It's because I'm white, isn't it? Jordan: No. Larry's white. So what? Murray: No, Larry's not white. Larry's clear. Stan: Let me help! I may not be tall… but I'm slow! Bogues: At least you guys are still tall. I'm nothin' now! Just another short guy. 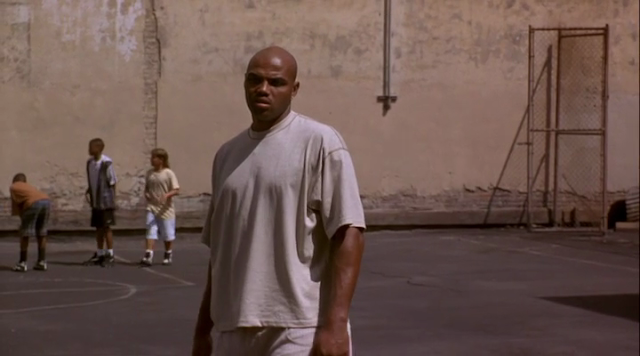 Charles Barkley: It was this girl, five-feet-nuthin'. Blocked my shot! Psychiatrist: When did you first start having this dream? Barkley: It wasn't a dream, it really happened!